First of all: These construct feats are obviously (mostly) made for monsters - and that is a good thing, seeing their power. When a prerequisite does not require being mindless or high-powered, golem-like powers, I'll not so in the feat! -Antimagic Aura: Requires immunity to magic, renders utterly immune to any magical effects not executed by the creator of the construct while it has one mythic power left. Interesting in that it gets the interaction of the monster ability and antimagic field right - too many designers overlook the finer details of the former. -Hardened Construct: This only requires DR of any kind, making it accessible to construct PCs. The feat increases DR by 5 and when affected by damage not subject to DR, you instead are treated as an object with hardness equal to DR. Oddly, when reduced to below half max HP, you halve said hardness. I'm not a fan of this "bloodied" condition, but that's just my opinion and will not influence the final verdict. However, I'd carefully consider whether allowing this for PCs - the feat's hardness-component is VERY strong. 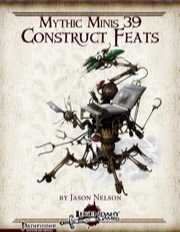 -Programmable Construct: Mindless construct gets + 1 non-mythic-feat, +1 per 10 HD you have. Feats that require a willing decision to sue are always used unless commands specify otherwise. These may be altered and full synergy with Mythic Craft Construct are provided. -Resilient Construct: Use Str instead of Con to determine Fort-saves and gain double the bonus hp of your size. Once again, cool for monsters, wouldn't allow it for construct PCs. -Self-repairing Construct: Gain fast-healing equal to mythic rank; use mythic power to double healing rate after a sustaining a crit; allows you to stack fast healing when suffering multiple crits. If you also have fortification, you can negate the crit for mythic power. Finally, expend mythic power to prevent destruction by attacks, healing 2 x tier per mythic power expended. Nice for mindless terminator monsters. -Smashing Stomp: If you hit a foe with two or more attacks, the foe needs to save or fall prone. This needs a caveat to specify the attacks have to SUCCESSFULLY HIT, not only be directed at the target, like the word "strike" implies. Additionally, the attacks probably should hit in the same round...as written, years can pass between the two attacks. As an immediate action, you can execute a pin when striking a foe prone this way, maintaining it as a swift action, dealing further damage to the target. Can be taken by PC constructs. -Vigilant Construct: +HD to perception and blindsight equal to 5 feet times mythic tier. 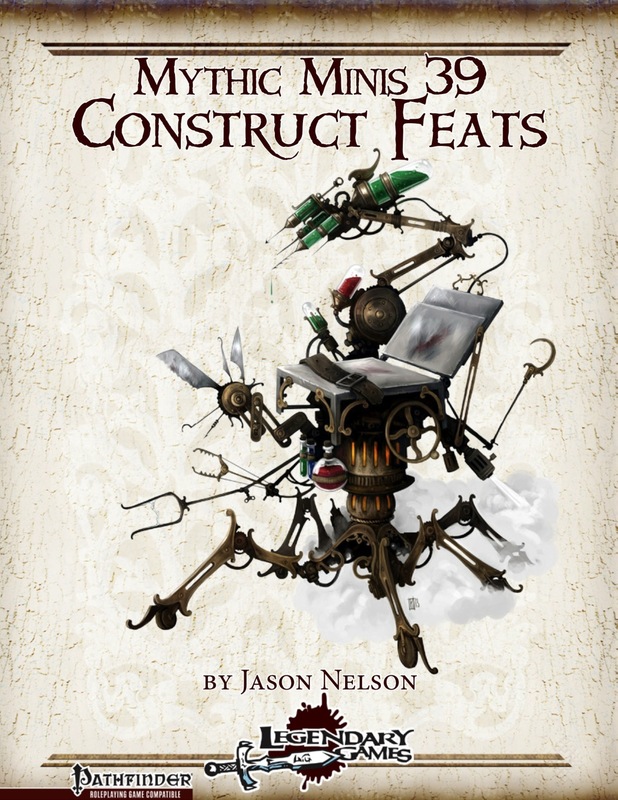 Jason Nelson's construct feats are pretty cool if your intention is to boost up the power of your constructs - and indeed, they are rather awesome, allowing for sentinel drones, truly impervious constructs etc. That being said, the pdf isn't particularly player-proof. While most mindless constructs definitely can use the massive power boost these feats provide to render them less fragile, the matter of the fact is that quite a few of these feats can cause problems when introduced into a game with a construct PC-race. It is my firm recommendation for DMs to render these feats DM-exclusive, in spite of what the prerequisites say. That out of the way, as a DM-supplement, this mythic mini is pretty awesome; for them, this is indeed one absolutely awesome little pdf. My final verdict will try to take the potential issue with construct PCs into account, but also the obvious intent of the pdf - hence, I will rate this mythic mini 4 stars. Woo, new mini! CRANIAL DISSECTIBOT FTW!